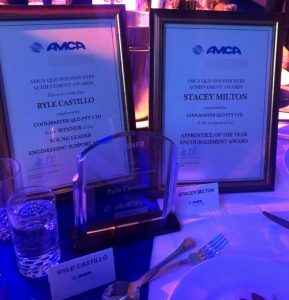 What a fantastic night for all at the 2018 AMCA Industry Achievement Awards Evening. No more so than for Coolmaster’s own Stacey Milton & Ryle Castillo. Stacey received the Apprentice of the Year Encouragement Award. A massive effort for Stacey, who is only in the first year of her apprenticeship and has done an amazing job. Keep up the great work Stacey. Ryle walked away with the Young Leader – Engineering Support award. Anyone who was in attendance would agree, what a consummate professional. Ryle was the deserved winner and his acceptance speech was fantastic. Ryle Castillo: Project Engineer – I was very honoured to receive the Young Leader – Engineering Support award. It’s always very moving when you get recognised for your contributions in some way, shape or form. 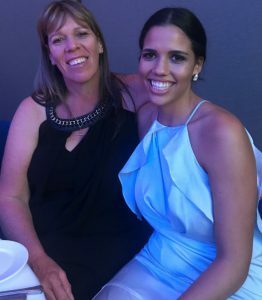 “It was a great night and obviously myself and the team at Coolmaster are all very proud of both Stacey and Ryle for their respective awards. They are both truly assets to Coolmaster and the industry as whole”.